Most late-model cars are designed to work seamlessly with iPhones, smartphones and other mobile devices. If your car lacks this feature, don’t worry. Joe’s Stereo offers smartphone integration kits, including iPhone integration kits, that let you access, control and charge your device through your factory stereo. Our affordable, high-quality in-car smartphone installation services make it a snap to connect your smartphone to your radio system. Think of us as your one-stop smartphone car integration shop. Audio Patch Cable – The easiest installation, this kit includes a 3.5mm audio patch cable that connects to your device’s headphone jack on one end and your stereo’s auxiliary input on the other. This doesn’t charge the device or allow you to control it via the stereo’s interface. Bluetooth Streaming Audio – If your factory stereo supports Bluetooth audio, you can connect your device wirelessly with this option. This doesn’t charge the device or display information on the screen. Limited amounts of control via the stereo interface may be available. 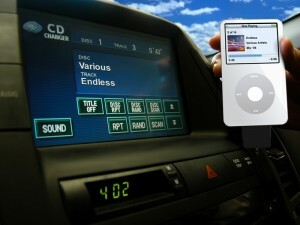 USB Connection – With this installation, a mini USB cable from your car stereo connects to your device. You may need to switch the stereo to USB output. This option lets you control your device via your factory stereo while keeping it charged. If available, it also displays information on the screen. Joe’s Stereo has been performing smartphone integration installations for more than 10 years. Regardless of the type of device or vehicle you have, we have you covered. We’ve installed countless integration kits and are often able to complete installations the same day. For more information, complete the form on this page or give us a call today.